•How many people is the kit for? •How long will the trip be? •Any activities with unique risks planned? •How remote will you be - how far from doctors and pharmacies? •Will there be kids on the trip? Take forms of medications appropriate for kids. •Any older people with heart disease, diabetes, etc? •Going to a hot environment? Take forms appropriate for heat - capsules and suppositories melt. What to use for your kit? The best I have found are the "Tupperware" type containers available in many sizes everywhere - they are tough and waterproof. Large fishing tackle boxes also work very well. •Analgesics, antipyretics(anti-fever), anti-inflammatories: acetominophen, ibuprofen, aspirin. non-stick bandages. Tape. Moleskin for blisters, especially if a hiking trip! More moleskin! •GI: antacids (milk-of-magnesia serves for acid or constipation), laxatives (constipation is the most common health problem in travel! ), immodium for diarrhea. Antibiotic appropriate for diarrhea. (with pus in the eye) or in the ear for "swimmers` ear" infection (characterized by pain when you tug on the earlobe) - you cannot put eardrops in the eye, however). •Antihistamines: diphenhydramine ("Benadryl") for allergies, itchy rash, nausea, or as a sleep aid. "Claritin" - good long-acting drug for respiratory allergies or hives. •Tools: splinter forceps, 3" ace wrap, scissors. Ask your physician for advice and assistance in preparing this kit. •Skin: steristrips, antibiotics for skin infection ("Duricef" or similar), mid-potency steroid cream such as "Cutivate". •GI: "Tigan" or "Compazine" suppositories for nausea and vomiting, metronidazole for presumed giardia (yellow frothy diarrhea not improved by antibiotics). •Narcotic analgesics: "Vicodin" - a codeine derivative good for pain or cough suppression. •Respiratory: Asthma inhaler such as "Proventil"/"Ventolin" for asthma, asthmatic bronchitis, or exercise-induced asthma. •Female health: Treatment for vaginal yeast infections ("Diflucan" 150mg tablets - 1 tablet = treatment). •Miscellaneous: Diazepam - "Valium" - useful for muscle spasm, anxiety, or a sleep aid. 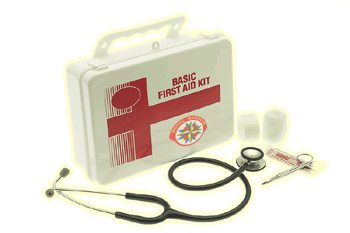 •The above does not include personal first aid items such as personal medications for illnesses or prevention. If preparing for a large group, consider taking extra antimalarials, antidiarrhe meds, etc. Consider odd items like an eyeglass repair kit, temporary dental filling kit, etc. •Phenergan or compazine injectable for severe nausea/vomiting. •Epinephrine for severe allergic/anaphylactic reactions. Consider your group carefully, and plan ahead. Review all of these things carefully with your physician before hand. Alcohol Wipes (12) - Use for cleaning needles, clippers, tweezers. Aloe Vera Gel - Use for minor burns or skin irrations that require soothing. Antibiotic Ointment - For the obvious minor cuts. Baking Soda - Use to make an anti-itch paste. Just add water and apply to the itch area. Band-Aids - Use for those little cuts and make sure to have an assortment. Benadryl - Use for alleries. Cotton Swabs - Use for cleaning or applying creams or ointments. Elastic Bandage - Get 2 of these, a wide roll. They are use for sprains, strains or in somce cases to keep a dressing over a wound. 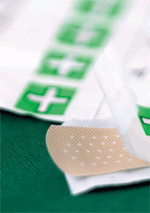 First-Aid Tape - We use both the 1 inch tape used in sports, and the conventional 1/2 inch tape. 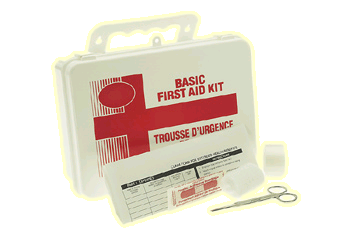 Having both has been useful for us in securing bandages. Gauze Pads - Make sure the pads are sterile, preferably packaged in individual packages. You`ll need several small pads for both covering and cleaning small cuts and scrapes. Get 3 large non-stick pads for larger cuts or scrapes. Gauze Roll - Use a 2 inch wide roll. It`s great for wrapping an injured arm or leg. Be sure it is also sterile. Hydrocortisone Cream - Used for itching caused by bug bites or plants. Make sure the cream is 1% or less. Ice-Pack - Use the chemical ice-packs. It turns cold when you break open the chemicals inside the pouch. Do not apply the ice-pack directly to the skin...just a side note. Ipecac - Use for poisoning. Latex Gloves - Use these whenever you have the possibility of coming into contact with someone`s blood, outside of your immediate family memeber`s. You want to use all the protection you can get. Magnifying Glass - Use for those hard-to-see slivers, etc., the one`s kids seem to attract. Mole Skin - Use for blisters. Safety Pins - Use for making a sling or pinning elastic bandages. Scissors - Use for cutting tape or even skin in certain situations. Sewing Needle - Use for those gruesome splinters. Small Mirror - Used to check eye problems, also as an emergency signaling device. Soap - We like using the liquid soap. Make sure it is not one just full of scents and get a small bottle of it. Soap is an excellent cleaner. Syringe - Find the kind that has a bulb on it, it is great for flushing wounds with water rather than applying a cloth. Tissues - A package of these can go a long ways. Good for bloody noses and general clean-up. Also, a great emergency fire starter. Triangular Bandage - Used as a sling. You can make one out of a light piece of cloth. Get a cloth approximately 42" x 42". Tweezers - Use to pull out those splinters. Tylenol - Use as a pain reliever or fever reducer.